I think some of my friends will get a kick out of this, This is the bed I had in a small home hostel in San Jose, Costa Rica. There were three bunk beds in the room. Most of the time I had this room to myself. A few nights there would be another woman in the room. This room would have been a children’s bedroom before the house became a hostel, but the room has no closets. 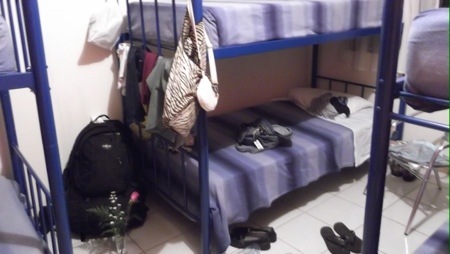 As is typical, bunk beds in hostels double as closets for clothing in use. Notice the flower. Flowers were a gift from my friend Kidron. Having a flower in my room was a unique travel experience. It isn’t too often that I sleep in a bunk bed, but at least when I do I typically get the bottom bunk!